The Volkswagen Up is everything that city car buyers love. It’s stylish, high in quality, fun yet comfortable to drive and even reasonably practical, but it’s not the cheapest city car around. The X-Trail is a spacious and comfortable five-seater, with the option of seven-seats, rivalling the likes of the Mazda CX-5, Skoda Kodiaq and Kia Sorento. 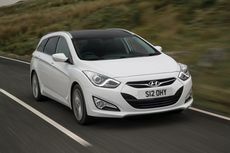 The i40 Tourer is a highly competent family-sized estate car, but it’s up against some formidable opposition including the Skoda Superb, Ford Mondeo, and Vauxhall Insignia. Find out why the Mercedes-Benz C-Class was the 2017 winner of our Best Car for Long Distances award. Find out why the Ford Fiesta was the 2017 winner of our Best Car for New Drivers award. Find out why the Skoda Kodiaq was the 2017 winner of our Best Car Launched in the Last Year award.